Flaherty Fardo, LLC are experienced slip and fall attorneys. Understanding and being able to prove why the fall happened is essential to win these cases. What Is A ‘Slip and Fall’? A “slip and fall” or “trip and fall” in Pennsylvania is the generic term for a personal injury which occurs when someone slips, trips or falls as a result of a dangerous or hazardous condition on someone else’s property. It includes falls as a result of water, ice or snow, as well as abrupt changes in flooring, poor lighting, or a hidden hazard, such as a gap or hard to see hole in the ground. It also includes falling on uneven sidewalks, being injured because of a slippery floor in a restaurant, or getting injured because of poor lighting or unexpected objects in your way. If you are a property owner and someone injures himself on your land, you may find yourself legally responsible for his or her injuries. If you are on someone else’s property and are injured as a result of a dangerous condition on the property, the land owner or business proprietor may be liable for your injuries. Thousands of business owners across our state invite residents into their restaurants, shopping centers and/or stores. Since the owners are inviting these paying customers onto their premise, they have a legal duty to make sure that their property is safe for its intended use. This legal duty includes keeping the sidewalks in front of their stores clear of ice and debris. In supermarkets, it means making sure that the aisles are dry and ready for customers to use. Too often, people are injured because of hidden defects in sidewalks, parking lots, and other surfaces. Injuries as a direct result of defective escalators or elevators can cause permanent and severe injuries. Flaherty Fardo, LLC understands that slip and fall accidents can happen. However, if the accident was directly caused by the negligence of someone else, then personal responsibility cannot be ignored. Victims of slip and falls may have permanent injuries and a lifetime of medical expenses. The most common permanent injuries are to the shoulders and arms, when the individuals try to brace themselves during the fall. A torn rotator cuffs are prime example of a permanent injury that can be caused by a slip & fall. Pennsylvania law allows such victims the legal right to be compensated for their injuries. It is always important to notify property owners and relevant insurance companies as soon as practically possible after an accident. If possible, a police report and/or incident report should be filed if anyone was injured. 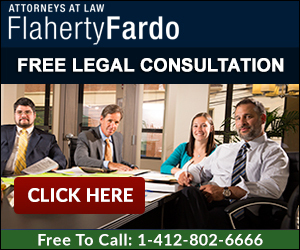 If you have any questions about slip and fall accident in Pennsylvania, Flaherty Fardo offers free consultations. Consultations can be done on-line or by calling our offices at 412.802.6666.